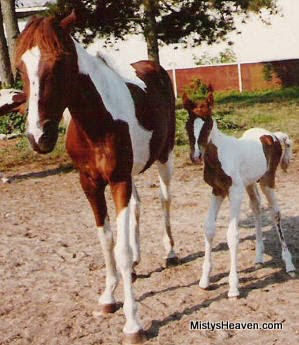 Tornado was Windy's fifth foal, and last of hers to be born on the Chincoteague Pony Farm. His sire was Cyclone, his half brother, who was allowed to roam with the Misty mares and breed to whomever he wanted. Shortly after he was born, Tornado and Windy were both sold to Mike Pryor of Waynesboro, Pennsylvania, and went to live on his farm in the fall of 1987. By this time, Tornado had been weaned and could live apart from his mother. Despite his name Tornado has a gentle personality and was even known to carry small children on his back when he was a yearling. To our knowledge Tornado remained a stallion, and has probably sired some foals, but we do not have any records on this. Please Note: There was also a feral stallion on Assateague named Tornado, and should not be confused with the Misty descendant.